February 26 was not a quiet day in the Donbas, most the of reports by local residents on social networks came from Donetsk, where artillery was active early in the morning and in the evening. 06:35 Donetsk: Since 6 am outgoing rounds from Petrovskoho, 3 series with a position change and 5-7 salvos, Gvozdikas? And it ceases towards 23:00. 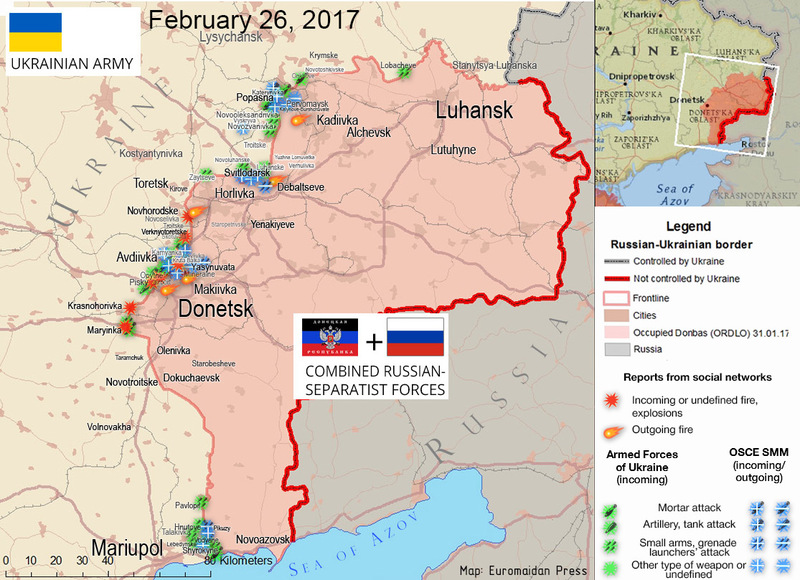 The situation in the Donbas on February 26, 2017, according to reports by local residents on social networks (red), ATO HQ (green), OSCE (blue). Updated. On February 27 HQ reported 56 attacks as of 18:00, one serviceman has been wounded. Mortars have been wodely used, a tank repeatedly attacked Avdiivka. The 1st week of the "#MSC2017 Ceasefire" for eastern #Ukraine ended with 41 Ukrainian casualties. The SMM recorded fewer ceasefire violations including over 700 explosions on 25 February and over 200 explosions on 26 February compared with more than 1,200 explosions on 24 February in Donetsk region. Within three hours before midnight on 24 February, while in “DPR”-controlled Donetsk city centre the SMM heard 169 undetermined explosions of rounds from unknown weapon systems 3-10km north-west and north-north-west. In Luhansk region the SMM recorded more ceasefire violations on 25 February, including over 200 explosions compared with some 150 explosions recorded on 24 February. On 26 February, the SMM recorded 80 explosions. The SMM recorded a total of 115 explosions assessed as caused by artillery rounds and 64 explosions assessed as caused by mortar rounds in the western and northern parts of Luhansk region on 25 and 26 February. While in “LPR”-controlled Kadiivka (formerly Stakhanov, 50km west of Luhansk) on 25 February, the SMM heard 137 undetermined explosions (75 of which assessed as caused by artillery rounds of unknown calibre) 10km north-west and west. We condemn Friday’s targeting of OSCE Special Monitoring Mission (SMM) monitors and the seizure of a SMM unmanned aerial vehicle by combined-Russian separatist forces. It is imperative that these forces halt their attacks on civilian infrastructure, including the Donetsk water filtration station. We call on Russia and the separatist forces it backs to immediately observe the cease-fire, withdraw all heavy weapons, and allow full and unfettered access to the OSCE monitors.